Sometimes; you just wonder why you didn't reach for the camera. I was sitting at the lower end of the Bowden Fish Hatchery this afternoon. 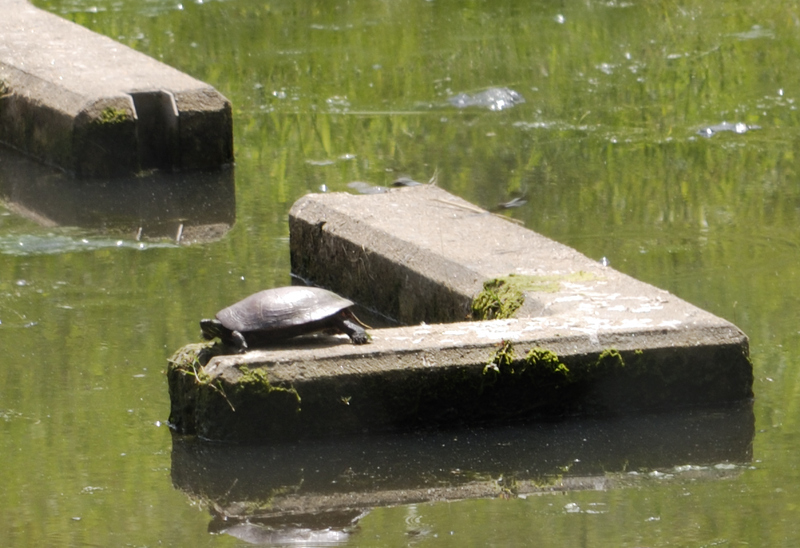 It was too hot for any birds and I was looking at this turtle; through my binoculars. I am guessing that it is a painted turtle. It was facing away in the mossy spot above the elbow of this concrete. Just to the left of the concrete; up popped what I thought was a baby duck. I looked away in search for the other ducks and when I looked back at the turtle, something was different. A huge snapping turtle was stalking the other turtle. Its head was above the concrete and had to be at least 5 inches wide. The other turtle didn't have a clue and I thought that it was going to be snatched up very quickly. As it turned out, I would have had time to get my camera from behind the seat; but at the time you never know. The snapper twisted its head and neck in every position it could think of, but the other turtle was just a little too far away. The snapper lowered its head and tried to attack from the left side of the concrete and by that time the other turtle got a little spooked. It must have sensed something. This shot is when it decided to head for the safety of the water. The snapping turtle circled the concrete twice searching. I believe that was the biggest Common Snapping Turtle that I have ever seen !!! I Finally Found Proof !! The Common Merganser (Mergus merganser) is a newly confirmed nesting species in our region. There have been confirmed reports on the upper Shavers Fork, Dry Fork and Cheat River. These are the first confirmed sightings on the lower Shavers Fork, near Bowden. I saw a lone female at this spot in June of 2009 and have checked it out numerous times since then; with no success. Today (5-27-12) I found what I was looking for! I was walking around near the river at 7:30 am; with my beagle Ralphie and heard a quack. I looked up and there they were, headed downstream and of course, I didn't have my camera with me. So, back to the truck we headed. I was trying to hurry and the truck was a quarter of a mile away. You just can't hurry with Ralphie. If I remember right; he got tangled up 6 times on the way back. We got the camera and I believe he only got tangled up 4 times on the return trip. We finally got back to the river and I couldn't find the mergansers. I finally heard them upstream from the original spot. Ralphie and I tried to sneak upstream; but a fisherman spooked them back down toward us. I was able to get a few quick photos as they went by.There were ten young in the group. Confirmed nesting success at last! It has already been a good day. I decided this morning to celebrate the end of the trout stocking season; by going fishing. I knew that I would have the streams to myself, even on Memorial Day weekend. Everyone knows that when the fish trucks quit running; that is the end of trout fishing for the year. This is when I start. No crowds and plenty of fish are out there; for as long as we have enough water and the water temperature stays down. I had a plan this morning and it proved to be a bad plan. I left my truck at daylight and just carried with me the things that I thought I would need. Thought is a key word here. I stuck a box of wet flies and nymphs in my vest and there was all ready a brown woolly bugger tied on my leader. Off; I went. The first section that I tried has changed, since I last fished it. The water is very low and no fish-holding structure was to be found. the bead-headed woolly bugger was getting hung-up on every cast. I moved further upstream, common yellowthroats, catbirds and yellow warblers were filling the air with song. Two hen turkeys were showing their numerous offspring how to find food. I was just soaking up the morning and finally found some rising trout. Many rising trout! I carefully got into position and cast and cast and cast to the fish; with absolutely no response. Nice fish, too. Mostly browns in the 12-16 inch range, splashing and slashing the surface. I of course had NO dry flies with me. I stood motionless in the stream for several minutes and finally saw what they were feeding on. Tent caterpillars were on the menu and they would sample nothing else. Of course, I had nothing to imitate the meal of the day. My terrestrial box was back in the truck. Moral of the story: Be Prepared and Be Successful. It was still a nice morning; though. I had a couple of hours to spend in the spring gobbler woods, this morning. The whip-poor-wills were very enthusiastic; as I was leaving the truck. The turkeys were silent. I was walking up a small ridge, shortly after daylight and a ruffed grouse flushed; about 4 feet away. There were 7 eggs in the nest. I believe this is the first grouse nest I have ever seen. One interesting note about it was that it was maybe 10 yards away from where I found a woodcock nest last year. I proceeded to stroll around on some log roads, waiting to hear a gobble. It wasn't going to happen on this day. I walked right into a silent strutting gobbler. Moving to a different area, I found the trophy of the day. Oyster Mushrooms (Pleurotus ostereatus) are one of my favorites. I usually do not find many of these edibles this early in the season. The spring woods offer many enjoyable bounties for the observant one. I sat for about a half-hour, called a few times and walked back to my vehicle. Of course upon arrival at my truck, I saw several turkeys feeding in an overgrown field; within 50 yards of my vehicle. You have to love May in the spring gobbler woods. The best time of the year.